The Volatility Stop Indicator helps to define the current trend. The indicator plots a red dot above the candlestick when a downward trend is detected, and a green dot below the candlestick when an upward trend is detected. These dots are commonly used as trailing stops. Trend reverses between up and down when Closing Price crosses the Volatility Stop. In the HRC/RWO trading rooms, we use special settings that were created after a year’s worth of detailed analysis on trades using this indicator. Those settings are True Range Period is 10 and True Range Multiplier is 1.50. 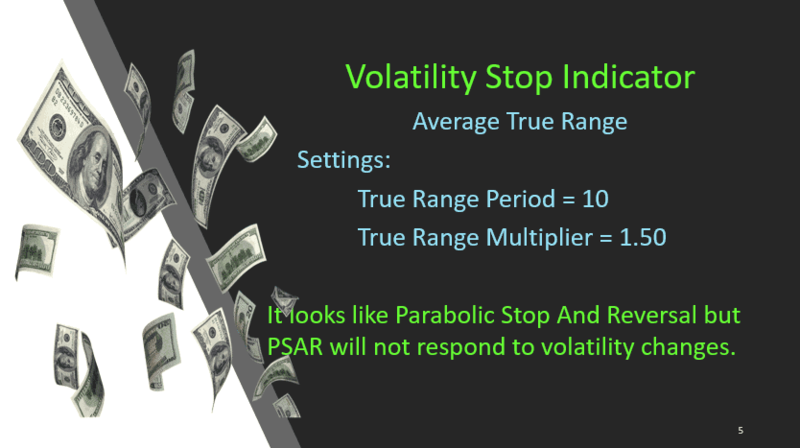 While the Volatility Stop looks like the Parabolic Stop and Reversal but the PSAR will not respond to changes in volatility. The Volatility Stop Indicator is available in the TC2000 Program and in our trading rooms, we share the code for creating in thinkorswim (TOS). In this eBook “A Strategy for Consistent Profit” the Volatility Stop is discussed.